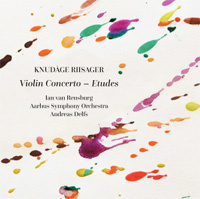 Description: Etudes (1948 and recorded previously by Chandos for a 1997 release) was the greatest success for the composer and choreographer Harald Lander (they also worked together on the much shorter and exotic Qarrtsiluni) and is one of Riisager’s last works in the neo-classical style influenced by 1920s France (Stravinsky, Prokofiev, etc.). Riisager’s choice of etudes mirrors the choreography which goes from simple training exercises to the virtuosic splendors of late 19th century Russian ballet. The 1951 concerto, in two movements - Tranquillo and Vivo - differs mainly in the absence of orchestral color for the sake of color; confrontation characterizes the wind and brass instrument’s usage in the fast movement and the soloist generally stands apart from the orchestra in the first movement. No less tonal than his earlier style - just more conscious of form and the interplay of lines. Ian van Rensburg (violin), Aarhus Symphony Orchestra; Andreas Delfs.